Book 7 of 100 from the Great American Read list. This is the first of the books on the Great American Read list that I couldn't wait to get through. It was such a slog. Normally, when I read a book that I dislike this much, I stop reading and I don't review it. So this might get controversial. A Confederacy of Dunces does not have a plot. Instead it meanders around New Orleans gathering descriptions of insanity, frustration and general uncomfortableness. Every sentence is as monstrous as the protagonist's stomach. The style is a deliberate choice, of course. If a sane reader is to have any empathy for Ignatius J Reilly we need to suffer through his torturous language and "world view" so that we can feel his impotence. But it’s hard going for me. The awkward humor of watching a character go through a mental breakdown always makes me cringe. Unfortunately, the Brits are brilliant at this kind of humor. Alan Partridge, The Office and (worst of all) The Royle Family make me look away while everyone else is laughing. When Ignatius is attempting to get support for his "Campaign for Moorish Dignity" on the factory floor, he gets embarrassed and starts dancing. At least I know where David Brent came from now. And yet, people apparently love this book. One of my colleagues told me that her boyfriend always has a copy of A Confederacy of Dunces with him. His copy is so well read that it's fallen in two halves. My American roommate from London who introduced me to my husband gave me her copy of this book when she left the UK. Thank god she has better taste in men than in books. So why is it on the list? Well, rants are fun to read and even though I don’t think it’s funny, I know other people who would find it hilarious. But there are other more complex factors at play. Ignatius has many ideas and most of them seem insane. His political ideologies are all over the road. I think if I had to pin down his “world view” I’d liken it to Kanye West in “Free Thinker” mode or Steve Bannon's "burn it down" philosophy. 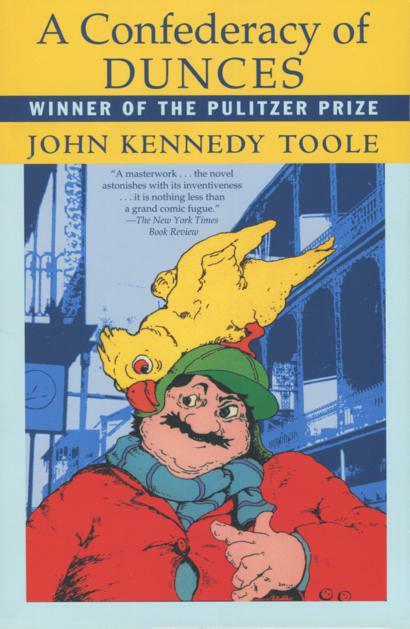 The fact that I can find parallels with Ignatius J Reilly in America today may seem remarkable, but I think it’s part of the appeal of the book. We all know an Ignatius J Reilly, I think one might currently be president. Having said that, I don’t think any of us is totally free of extreme ideas. I think we can all find something in Ignatius’ ramblings, which we might be persuaded to believe, given the right encouragement. I have noticed that belief is often confused with truth, as I saw in a Facebook comment a few weeks ago “don’t argue with a liberal, they just ask you to prove it”. And Americans love to believe, especially in themselves. But not everyone’s beliefs can be true. Just as not all of Ignatius’ legion of beliefs can be true. So like any good satirist the author turns up the volume on our ideas and shows us how absurd they are. I’d like to finish up with a few thoughts about the women in this book. There are no sympathetic female character here. There are some male characters that we warm to, Burma Jones was a favorite of mine and the long-suffering but fair-minded Gus Levy seemed to be the most sensible character in the book. But the women are just charicatures. Almost all the disasters that befall Ignatius in A Confederacy of Dunces could easily be attributed to the women in his life. His mother spoils him, his girlfriend provokes him, the woman he believes will be the love of his life is not what he expects and even the women of the choir at the factory undermine his authority. Ignatius believes that he has no agency, he is tossed from one misadventure to another by the capricious turns of Fortuna’s wheel. But all these women, including Fortuna, are not responsible for Ignatius’ mistakes. He is. I walked away with the uncomfortable feeling that Ignatius might now be described as an incel. But uncomfortableness is the point of satire and it’s definitely the point of A Confederacy of Dunces. Maybe I should have written a one word review.